Having oily skin can be the biggest pain ever, simply because nothing actually stays on the skin... it just slides off or slides in different areas of the skin depending on the oiliness. I do have oily skin and finding a foundation which isn't expensive and that doesn't leave me looking shiny after an hour of wear is something I always look for. No7 Beautifully Matte; This foundation is incredble in regards to coverage and keeping shine completely at bay. It does last also for hours, when I wear this at work I apply it at about 7am and get home at 5.30pm and it has not budged so it is definitely a favourite of mine. You can purchase this foundation here and the price is £14.50 which is at the higher end of a drugstore foundation but still better than paying at least £22.00! The only downside of this foundation is the shades that are available, my skin is very yellow toned and I did get coloured matched to the shade cool ivory which is far too pink for me. Soap & Glory One Heck Of a Blot Foundation; Purchase here for £10.00. I do have a love/hate relationship with this foundation and I mean that in a way say, if my skin is having a day where it does decide it wants to have patched of dryness then this foundation will not fit this skin day at all. This foundation is for those who have VERY oily skin. It is a liquid to powder form and I really recommend not powdering over the top of this foundation and you'll be in cake city - no joke. But you have to try these different applications of foundations because they all have different textures. As for staying power, again it does last hours and hours but afterwards if you keep powdering then the foundation does start breaking up on the skin. 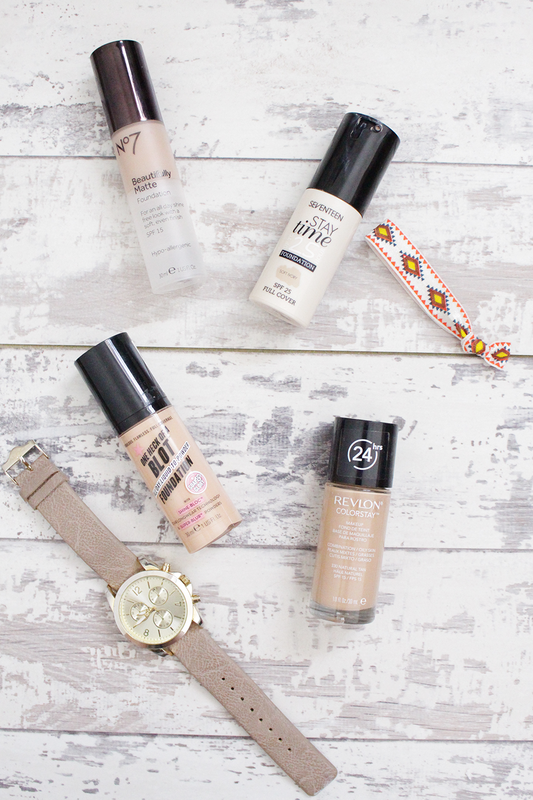 Seventeen Stay Time 25hour Foundation; I have recently published a blog post all about my thoughts on this foundation which you can read here so I won't go into too much detail. Basically I believe this foundation is a dupe for my FAVOURITE foundation MAC Pro Longwear - seriously the shades of this foundation are yellow toned too which is a saviour for me. It is incredibly cheap too! Revlon Colorstay Oily/Combination; This has been raved about many times and is because it is a fantastic foundation and staying power is again great. Shade variety for this foundation too is great because of the wide availability. Finally they did decide to add a pump onto the bottle which also is a relief and I have been one of many to pour far too much foundation out of the bottle! This is £12.99 which agains steeper price for a drugstore foundation but you have to use hardly any! Purchase here.